Photo: Enoch Rosekrans House, ca. 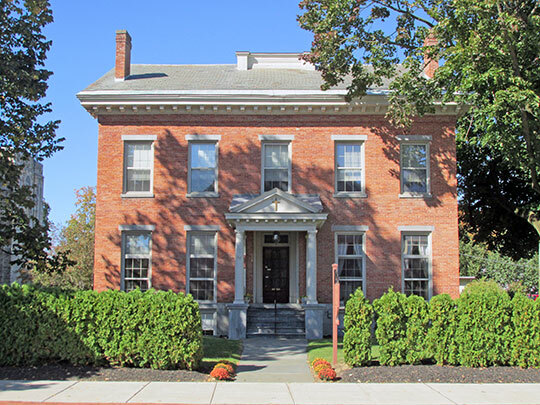 1855, 62 Warren Street, Glens Falls, NY. Listed on the National Register of Historic Places in 1984. Photographed by User:John Phelan (own work), 2013, [cc-by-3.0 (creativecommons.org/licenses/by/3.0)], via Wikimedia Commons, accessed November, 2013. The Warren County Courthouse is located at 1340 State Route 9, Lake George NY 12845; phone: 518-761-6535. Warren County, an 876-square-mile area in the northeastern part of New York State, once a part of Washington County, became a separate entity on March 12, 1813. Named for General Joseph Warren, who was killed at the Battle of Bunker Hill, it embraces eleven towns under the government of a sixteen-member Board of Supervisors, one from each town and five from the city of Glens Falls. Except for the region surrounding Glens Falls, Warren County lies wholly within the five-million-acre Adirondack State Park, the largest in the United States. Across it, from northeast to southwest, run four mountain ranges, the Luzerne, Kayaderosseras, Schroon, and Boquet. Glens Falls and its environs spread over a strikingly level, sandy plateau (400 alt. ), but to the north and west the almost continuous mountain ranges, three to fifteen miles apart, give the country a rugged aspect. Isolated peaks and jutting spurs, such as Potash Mountain (1,680 alt. ), near Lake Luzerne, and French Mountain (1,522 alt. ), at the head of Lake George, take up much of the land between the ranges. However, the rounded crests of the mountains, softened by a covering of forest verdure, give the skyline a gracefully flowing contour. Paralleling the mountain ranges, and occasionally cutting through them, are picturesque valleys, some broad and pastoral, others wild and deep, but all infinitely varied in scenery open fields and dense forest, winding river, clear lake, and quiet pond. In the southernmost valley between the Luzerne and Kayaderosseras Mountains, only a low divide separates the headwaters of Lake George from the sources of a chain of ponds and lakes, including Vanare, Forest, and Allure, which feed Lake Luzerne; this in turn empties its waters into the Hudson River. Through a narrower valley with steep wooded sides, a mere gap in the mountains, the main highway, US 9, follows a stream from Lake George Village northwest up an easy grade to Warrensburg on the Schroon River, near where the latter stream joins the Hudson. The next valley, following the general trend, forms a triangle with the two just described. It extends from the open country around Luzerne up the narrow gorge of the Hudson to Warrensburg, where it spreads out to include the Schroon Valley, one of the most extensive and fertile farm areas in Warren County. At Horicon the outlet of Brant Lake enters the Schroon Valley from the east, and a few miles beyond lies the southern end of mountain-hemmed Schroon Lake, the northern boundary of the valley. The large streams that drain most of Warren County — the Hudson and its tributaries, the Schroon and East Branch Sacandaga — flow south. The rest of Warren County drains into Lake George and Lake Champlain, whose waters flow north into the St. Lawrence River. The Lake George basin is so narrow that rainfall a short distance west of its shores reaches the ocean a thousand miles farther south, by way of the Hudson River. Glens Falls rises steeply from the banks of the Hudson, but most of the sandy plateau upon which it is built drains toward Lake George and Lake Champlain. The upper Hudson River is swift; it drops almost a thousand feet in the fifty miles it travels from the Essex County line south across Warren County and, in a sweeping arc, east to Glens Falls. Up from Corinth the Adirondack branch of the Delaware and Hudson Railroad and a state highway follow the river through its deeply cut, rugged valley, which at times narrows to a ravine flanked by peaks that rise precipitously to a height of 1,500 feet above the stream. The railway stops at North Creek, but the highway continues into Essex County. West of the Hudson River in Warren County the mountains are higher, the valleys narrower, the villages smaller and fewer, and there are large areas reached only by woodland trails. Indeed only one through highway, State 8, crosses the 25-mile western boundary line into Hamilton County. Gore Mountain towers to a height of 3,595 feet and there are many lakes and ponds of glacial origin, several at an altitude of more than 2,000 feet. The streams that do not drain directly into the Hudson River help feed the Sacandaga Reservoir, which controls floods and maintains a steady flow into the Hudson River during dry seasons. Lake George, the largest body of water in the Adirondacks, dotted with many islands, lies almost wholly in Warren County. Occupying one of the deepest basins in New York State, its surface, only 323 feet above sea level, looks up to mountain heights of over 2,500 feet. Prospect Mountain (2,021 alt.) and Tongue Mountain (2,258 alt.) tower conspicuously above the Warren County shore, while even more imposing peaks rise from the east side, Black Mountain in Washington County (2,665 alt.) being the tallest sentinel. Schroon Lake (807 alt. ), which juts into Warren County from the north, is more than nine miles long and averages about a mile in width. Brant Lake (801 alt. ), a few miles to the southeast, measures six miles long and a half mile wide. Not far away is Loon Lake (866 alt.) an irregular triangle that affords a vista of more than two miles across its surface, and just south of that is Friends Lake (915 alt. ), only a little smaller. In the northwest corner of Warren County, Thirteenth Lake (1,674 alt.) lies nestled among tall peaks. In the southwest corner is Harrisburg Lake (1,494 alt. ), two miles long, lying at the end of the road that climbs up a narrow valley from Stony Creek. In the southern projection of Warren County, Lake Luzerne (624 alt. ), a mile long and half a mile wide, lies close to the Hudson River. All of these and many smaller lakes and ponds are reached by good roads, but there are scores of others that can be approached only by woodland trails or bridle paths. Warren County is subject to wide extremes of temperature varying from about 40 below zero in the coldest winter nights to a 37-year record high of 101 at Glens Falls in summer. The nights are usually cool even during July and August. Light frosts have been known as late as June 20, and as early as August 26, but killing frosts seldom come after the middle of May or before late September. The mean annual temperature varies from 46 in the southern part to 43 along the mountainous boundary as compared with 52 to 53 for New York City. The growing season for crops varies widely in different parts of the county. In the Glens Falls area there is an average of 151 days without frost; at Lake George, 140 days; and at North Creek, only 134 days. The annual precipitation over the southern slopes of the Adirondack Mountains, including Warren County, is about 35 to 39 inches, higher toward the north; but during June, July, and August there are comparatively few rainy or cloudy days, though there are occasional severe electrical storms. In early spring and autumn there are likely to be cloudy days and chilly evening fogs. Winter snow fall, with a yearly average of 68 to 75 inches, is heavier at the higher altitudes and in the northern part of the County. It varies from year to year, but there is usually snow for winter sports in the mountains for several months, and some winters bring deep snow to the valleys and the Queensbury plain. Except at high altitudes and on a few exceptionally cold days, there is usually a slight thaw daily in the early afternoon sun, but those unaccustomed to such low temperatures as occur even in the bright early morning sunshine must be especially careful to protect ears, hands, and feet, wear warm clothing, and keep active while out of doors. Warren County Board of Supervisors, Warren County: A History and Guide, Writers' Program of the Works Progress Administration in the State of New York, American Guide Series, Glen Falls Post Company, 1942.